The usual reviews, farewell to Black Bolt 12, hello Exiles #1 and a regular review of Ms Marvel 29. Join us for a fairly in depth chat of these books as well as just how these books relate to real life – some fairly deep chatter there. Episode 42 for you! In this episode Seren, Doc and Adam talk about the news of the Death of the Inhumans written by Donny Cates – is it the end of our favourite characters? We also discuss Ms Marvel 28, Moon Girl 29 and Lockjaw 2. Seren, Doc and Adam discuss everything from the previous few weeks in the Inhumans world. Moon Girl and Devil Dinosaur #28, Black Bolt #11 and Lockjaw #1. As well as the regular news and chat that we all love! Episode 40 – Special Guest, Daniel Kibblesmith! 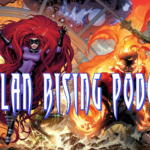 In this special episode of the Attilan Rising Podcast, we’re joined by Daniel Kibblesmith, writer of the latest Inhuman series – Lockjaw! Conversations about everything in this book, and more! Contact us: theshow@attilanrising.com or @AttilanRising1 on Twiter. Adam and Doc discuss everything from the previous 5 weeks in the Inhumans world. Moon Girl and Devil Dinosaur #27, Ms Marvel #26, Black Bolt #10 and Inhumans: Judgement Day #1. Adam gets a little ranty at Inhumans Judgement Day, and we have a little chat about the upcoming changes in the comics world coming later in the year. Episode 38 – Welcome to 2018! Despite what Seren says in the intro, this is actually Episode 38. First episode of 2018 where we talk about Ms Marvel #25, Moon Girl #26, Secret Warriors #11 and Black Bolt #9. Plenty of laughs, enjoy the episode! In this Seasonal episode we review Black Bolt #8, Secret Warriors #10, Once and Future Kings #5 and Royals #12. Episode 36 – Crystal.. I mean, Human Torch is back! In this episode we review Moon Girl and Devil Dinosaur #25, Secret Warriors #8 & #9 and Royals #11. Also competition announcement! Episode 35 – “How I Am Is Inconsequential” Comics Reviews! In this episode we review Moon Girl and Devil Dinosaur #24, Ms Marvel #24, Black Bolt #7, Secret Warriors #7, Once and Future Kings #4 and Royals #10. First episode post Inhumans TV show, this is a bumper episode full of reviews – some streamlined though.